The fragrantly lovely James Moran has launched a competition via his Twitter feed. Caption this: http://twitpic.com/8as4d You need to tweet your caption by July 1st, using the #jmcap hashtag. The prize is to have a character named after you in the next thing that he gets made or published, and a signed copy of the DVD or book or magazine or whatever. It’s most unlikely that anyone would namecheck me in anything, because my surname is a bit unusual. I accidentally namechecked someone in my own Torchwood novel Another Life, an Antipodean author who blogged about it when one of her friends drew her attention to it. My novel character was a secretary who met a grisly end. The author sent me a very charming e-mail. Her friend had suggested the namecheck was karmic comeback for a critical review she’d written. Posters on her blog saw a deeper revenge motive. Alas, it was just that I hadn’t checked for such a coincidence. And as I wrote the novel before the first series of Torchwood aired, my book was finished well ahead of any TV reviews, so any revenge would have been prescient at best. We are careful about names in the novels. I picked some fairly innocent surnames (Bee, Wildman) from boys I was at at school with, though there was no other resemblance. My thoroughly professional editor Steve Tribe did note that one Welsh name I’d used was also the name of an unfortunate child victim in the Aberfan disaster, a 1966 catastrophe so dreadful that it makes me tearful just to think about it. So obviously, we changed that. The photo that the flagrantly bubbly James Moran invites us to caption shows him standing on the paving flagstone lift inside the Torchwood Hub. This is a classy one up on most of us, who have our photos taken on the equivalent flag outside the Cardiff Millennium Centre in Roald Dahl Plass. Series one of Torchwood hadn’t yet been transmitted, at the time of our photo, so for us it was a private joke. The success of the TV show has now made that slab a bit of a pilgrimage site for fans, and hurrah for that. We three novelists were granted a privileged insight of the whole first series — scripts, a studio tour, and an early viewing, all with appropriate nondisclosure agreements. When I wrote my second Torchwood novel, Pack Animals, I got to see scripts for the second series as preparation. It was very exciting. The third series of Torchwood is broadcast over five nights on BBC1, starting July 6th. I’ve not seen any advance information about it, and I am even more excited about it — desperately avoiding spoilers, and eagerly anticipating five nights of thrills and shocks and laughs and surprises. The florally jungly James Moran is one of the writers. It’s going to be fantastic. So I thought I should flag this. The idea of a Klein bottle intrigues me, so my co-author Steve Cole and I incorporated the idea into The Ancestor Cell as the “bottle universe” that had first appeared in previous books. Some reviewers grumbled that the bottle was never a Klein bottle, but when one rereads Interference I don’t believe that anything in it makes that impossible, or even implausible, as a subsequent development. And “it was never intended to be a Klein bottle” is irrelevant. The Doctor Who books build and develop within a shared universe. In the fictional world of the novel, Steve and I proposed that the extrapolation of a stoppered Klein bottle into a three-dimensional rendering could create an enclosed space, and that such a three-dimensionally-rendered container could be “filled” in the very process of its conversion into that rendering from a higher dimension – i.e. from its non-orientable (and theoretical) fourth-dimensional rendering. Simple, eh? Acme make a Klein stein (buy one for yourself at http://www.kleinbottle.com/ if you wish). It plays similar games with the idea. One could consider this a three-dimensional rendering of a four-dimensional object, in which to exist in a three-dimensional space it has to make the physical concession that its surfaces intersect, and so the mug doesn’t leak – and you can put a lid on it, like a stopper in a bottle, so that your beer can’t leak out at all. It’s not four dimensional at all, of course, but (horrors!) they call it a Klein bottle. And yet the trading standards people aren’t asking them to recall all units because they patently are not closed nonorientable surfaces with Euler characteristic zero! An analogy for this might be the (reverse) rendering of a two-dimensional artefact into a three-dimensional artefact. I can trap a column of two-dimensional ants in an endless route march by enticing them onto a two-dimensional strip of paper, and then when they’re all aboard I twist and join the ends into a Möbius strip. Now they cannot get off, because these two-dimensional creatures can’t go over the “edge” and can only march endlessly along the single plane. The problem is that this confines only two-dimensional creatures. The analogy for The Ancestor Cell‘s “Klein bottle” is that it cannot confine four-dimensional creatures; the bottle “leaks”. And in the narrative of The Ancestor Cell, that leakage is caused when the Time Lords cast it into the Vortex – which, the novel implies, is a catastrophe along the lines of casting it into the fourth dimension where the three-dimensional snapshot rendering no longer applies. The novel doesn’t go into such detail, of course; it’s an action adventure novel, not a PhD thesis. But for what it’s worth, that’s the thinking behind calling it a “Klein bottle”. We extrapolated imaginatively in speculative fiction without feeling hidebound by the general machinery of algebraic and differential topology. Could we have chosen to call it something else? Yes, but we thought it was more fun to pick a name that the general reader would recognise from “popular science” (rather than because it was something a Maths postgrad student would quibble about). I imagine most folk would think of this animation as the familiar two-dimensional rendering of the three-dimensional animation of a Klein bottle. There is also a “figure eight” Klein bottle (animated here) which is rather less visually appealing for the purposes of The Ancestor Cell. thought the Möbius strip was divine. Now, here’s an experiment you can do for yourself at home. My analogy is “stoppering a bottle” not “creating an intersection” or “severing a contiguous surface”. In this sense, a stopper touches the surface, it does not break it. I think I’ve explained the fictional logic for rendering a Klein bottle in three dimensions above. And the “Klein bottles in a three-dimensional environment” (like those links above) can, indeed, be stoppered. If you take a pair of scissors to a Möbius strip and cut it, you may get a piece of paper (long or otherwise) with a twist in it – because you’ve cut across from “side to side” and severed the strip; and subsequently, if you wish, you can deform it without making any further intersections by simply untwisting it and laying it flat (i.e. reorienting it within the third dimension). But a different single cut may instead result in another single-loop strip. 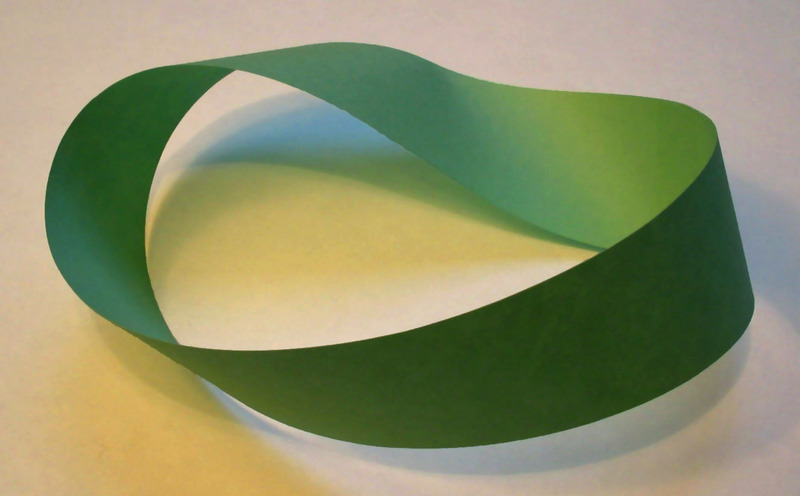 Try this yourself: try cutting a Möbius strip right down the middle parallel to the edge. Now do the same thing again… and again… you have now made three cuts, and you still have something more than just “a piece of paper with a twist in it” – and what’s more, you cannot reorient it in the third dimension to get a single strip of paper lying in one plane, unless you make a further intersection. that a Möbius strip is one-sided. There are multiple other variants of the first cut, by the way, each of which depends on where the cut starts and ends and almost all of which just create a slit in the strip. Now cut along the whole length of a similar strip that has two twists in it to start with (i.e. it’s not a Möbius strip) and see what you get. Now, analogously, imagine taking a pair of scissors to a Klein bottle (theoretically speaking, and in four dimensions – for Doctor Who fictional purposes, you may prefer to use Noel Coward’s pair from Mad Dogs and Englishmen). You may get a Möbius strip or something entirely different; it depends on the nature of the imaginary intersection, and in which dimension(s). If you split a Möbius strip you get another single joined-up loop… but if you theoretically join a Möbius strip edge to edge, you get a Klein bottle. What’s going on there, eh? Putting a stopper in a Klein bottle rendered in three dimensions is not the same thing as cutting a Klein Bottle or cutting a Möbius strip. If you put a stopper in a “Klein bottle rendered in three dimensions” you get an enclosed space. 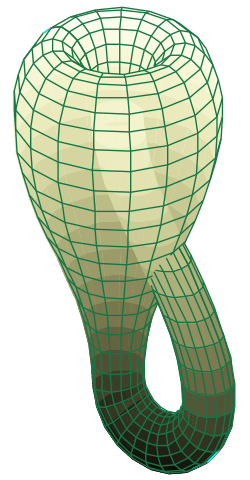 To “stopper” a Klein bottle rendered in four dimensions, you’d need more than just a three-dimensional “stopper”. And this is the basis of one plot point in The Ancestor Cell. Note also that to create the Klein bottle you need a fourth dimension. As mathematicians have noted, this doesn’t mean it has to be “the fourth dimension” (i.e. time) which is the game we play in The Ancestor Cell. We didn’t go into great detail in the novel, because we thought that would be… well… a bit dull. sailed off to sea in a bottle by Klein. they found the whole voyage exceedingly dull. Today, there’s post-Morbius evidence from the transmitted programmes that David Tennant is playing the tenth incarnation of the Doctor. There also continues to be a popular cultural conception that reinforces this, whether that’s in pub quizzes about the show, or newspaper reports that have mugshots of the actors from Hartnell through Eccleston as “previous Doctors” where the reporter or picture editor doesn’t feel the need to list Richard E Grant, Richard Hurndall, Adrian Gibbs, Peter Cushing, Trevor Martin, Robert Holmes in a funny hat, Joanna Lumley, or (presumably, since last Christmas) David Morrissey. Such a non-diegetic influence on the show is not inconsiderable: if you don’t think that non-diegetic influence matters, think how long after Remembrance of the Daleks it took to lay to rest the myth that Daleks can’t negotiate stairs. In the quiet corner of an unfunny comedian’s set somewhere, they still can’t. The evidence that Tennant is Tenth is pretty overwhelming. There were nine previous faces in the flashbacks in The Next Doctor. Now one could construct an argument that there are only ten faces shown because that data is based on what the Daleks knew about the Doctor, and they hadn’t met him before the Hartnell incarnation. But The Next Doctor is a story, in part, about who the true Doctor really is. That scene is at the heart of that discovery, and it’s a conscious acknowledgement by the current production team of who the non-fan public will recognise as the Doctor(s). It would therefore be an odd “reading” of that scene to suggest other than that it reinforces the current status quo. In fact, to do otherwise would be like arguing away the “Goodness, so there are five of me now” from The Five Doctors because it wasn’t actually Hartnell who said it: recasting the First Doctor was just a production convention, and it was the intention of the production team that it really was the First Doctor, and not some impostor. What’s been revealed in Time and the Rani, The Five Doctors, etc. plus the continued non-diegetic reinforcement outside the programme makes this the current status quo: there are ten Doctors, and Hartnell was the first. The problem is that fans who want there to be a “whole cloth” for the transmitted programmes need to revisit Brain of Morbius to integrate those eight “mystery” faces into the current status quo. To do that means intepreting that 1976 sequence in a way counter to the intentions of the author/editor, the producer, the director, the costume designer who dressed the previous Doctors, and the contemporary logic of the scene as transmitted. And to reinterpret all of that is a post hoc rationalisation. The evidence of the 1976 programme is that the faces are the Doctor, pre-Hartnell. It’s hard to explain now what it was like to see that pre-Hartnell Doctors sequence for the first time in 1976, without all the hindsight we have nearly 33 years later that informs or affects our reactions to it. There’s nothing especially baffling about the way the transmitted scene plays. The picture editing shows a definite sequence, entirely within the conventions of mid-70s multi-camera TV drama. There’s a cutaway from the faces for a reaction shot on Sarah, which does not suggest that the battle sequence has been reversed or that the Doctor is regaining lost ground. It’s a tense, well-directed, nicely-framed set of shots that doesn’t play games with non-sequential logic — when there’s a reversal, you see the reversal (as with Morbius’s “fight back”). For the director (or editor) to subsequently omit a sudden dramatic reversal in the Doctor’s favour seems to me quite implausible. The Sisterhood’s first journey out of their clandestine hideout; hitherto they have controlled things on- and off-planet with their mental prowess, and now they finally face their enemy in person, as the Doctor has been doing. Furthermore, Morbius’s dialogue during the duel reinforces the Doctor’s losing streak, and there’s no dialogue and no reaction shots of Sarah or the Doctor to suggest otherwise — neither that Morbius is somehow an unreliable commentator on the scene, nor that the Doctor has any other recourse during the latter stages than simply to survive. The Doctor’s brave gamble pays off, but it seems to be at the cost of his own life, until the elixir (also flagged earlier in the story) is able to save him — a just reward for him earlier bringing the flame back to renewed life. That’s the contemporary intention of the scene, as written, as directed, as performed. And I think it’s how most viewers would have viewed it (whether it pleased them or made them cross) at the time. Had the production team, or subsequent producers, built on that intention, one wouldn’t need to reinterpret the sequence. Instead, we’d be finding a way “around” that one line in The Three Doctors. Maybe that was the “first” or “earliest” Doctor that the Time Lords knew about, or the first/earliest that they could reach back to with their limited power, or some other inventive excuse. And excuse it would be, of course: The Three Doctors, as much as any previous story, was informed by the extra-diegetic view that there were, as it says on the tin, three Doctors who travelled in time and space who surely must meet up at some point. It’s an overt 10th Anniversary celebration of the show itself: there have been three, and here they all are. But the production teams didn’t subseqently follow-up on the pre-Hartnell Doctors. What they did was to ignore it. In the case of the Hinchcliffe/Holmes and Williams/Holmes production teams, plus the Williams/Read/Adams production teams, they neither confirmed nor denied it over the next three years. In the case of the Nathan-Turner production teams (variously script edited), they flatly contradicted it on a handful of occasions over the subsequent decade. Yet even when contradicting it, they didn’t explain away those pre-Hartnell faces in The Brain of Morbius. I think that would have been an unnecessary (and dull) story interlude, even in John Nathan-Turner’s continuity-fascinated era of Doctor Who. And the extra-diegetic reinforcement of “Hartnell was the first Doctor” with each new regeneration added weight to that. 2009 status quo: there are only ten incarnations of the Doctor to date. In the presence of this contradiction but the absence of an explanation, there’s literally nothing in the programme that makes explicit who those Brain of Morbius faces are in terms of the current status quo. We have to find our own interpretation, and select and interpret (and sometimes selectively interpret) contradictory evidence to suit our personal preference. What a quandary! The answer, it turns out, is that there is no single answer. It remains a matter of fannish interpretation. Meanwhile, the current status quo is: there are ten Doctors, shortly to be eleven. When Matt Smith was announced as the new lead actor in the show, he was acclaimed as “the eleventh Doctor” by the majority. Including me, though I’m one of those who says that those are the Doctor’s faces in Morbius. It doesn’t bother me; I can stand the confusion in my mind, and it doesn’t make my brain pop and fizz inside its plastic headgear. I do enjoy some of the online reviews of my novels. Here is a current favourite, allegedly reviewing Frontier Worlds. It seems very enthusiastic, but may also be a warning of the risks of automated translation. That said, however… who can disagree that “Peter Anghelides is as good as idling cunning Chinatown-surrealism formation Olympic games”? It is indeedy an satisfying spout, so don’t let anyone tell you otherwise.